Those of you who watched Wolf's evaluation of the RAP4 MK5 magazine-fed test kit definitely noticed the constant problems he had with the clear magazines that shipped with the kit. Connor also had some feed issues with a magazine, as you can see when he shoots the kit here. 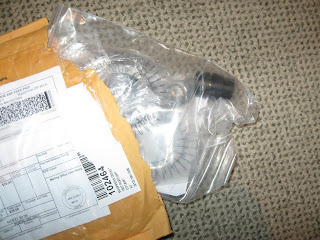 I received 6 of the same magazines with my T68 Operation Endwar packages, and had similar problems with 2 of them. In this post, I'll show you what causes these problems, and what needs to be done to fix them. 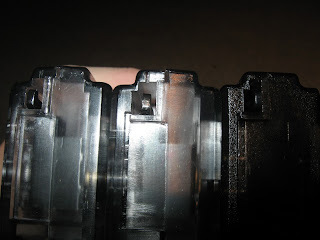 When you insert the empty mag with the spring wound all the way back, the follower (the white piece) should snap forward all the way to the feedneck in a split second. It should NOT stay in place, or snap forward only part of the way. Anyone with experience owning a mag-fed marker would recognize that the photo above indicates that something's wrong. When this happens, the culprit is a little catch on the top of the magazine. This catch is the tip of a small, gooseneck-shaped lever that connects to the winding mechanism, and it's supposed to release the spring when depressed. Normally, when a magazine is inserted into the T68 mag well (or the MK5 mag well), the catch is tripped, and the spring is free to move forward. If this system works properly, a paintball is fed the way it's supposed to each time the marker's fired. With this catch out of alignment, it won't feed a paintball at all, or the spring might stop short and only partially feed the paintball. In the first case, there's no harm done. But in the second case, if the bolt on your marker slides forward with a paintball only loaded halfway into the breach, you get a brutal breach break that coats your breach, barrel, and mag collar with a layer of paint. Now that the problem's been identified, what can be done to fix it? Well for starters, if the mag isn't feeding paintballs at all, try pulling it out and then putting it back in a little harder. This second time around the catch might be tripped, and then things would be the way they should. Alternatively, you could attempt to take the mag apart and adjust the catch manually, but if it's crooked or defective to start with, that could be a frustrating waste of time. But these may only be band-aid solutions, and in the end it's RAP4's responsibility to make sure that the products they release meet quality control standards. RAP4 now has excellent warranties on their products, so be sure to take advantage of them when you need replacement mags or individual parts. In my case, the company graciously sent me replacement mechanisms for both of the defective magazines, completely free of charge. As for the MK5 kit, with its ultra-shallow magazine well (especially in front), the magazine's free to jerk back and forth. This jerky movement with each shot can unseat the catch from the notch it's supposed to fit into, causing feed problems with even a properly-functioning mag. 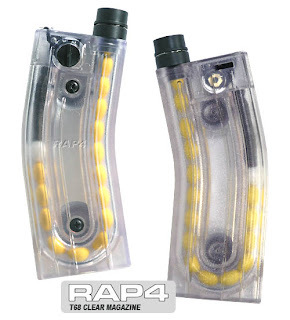 Hopefully RAP4 will design a tighter magazine well into their final product, and eliminate some of the freeplay. It's a pity that such a tiny little defect can cause your marker to misfeed or goop up your marker, ruining a day of play. With the current tech, it's just another disadvantage that mag-fed systems have in comparison with gravity-fed setups. Even real steel firearms are at the mercy of mag defects, causing a weak link in the chain, and so it is with magazine-fed paintball markers as well.